bcbio runs with Common Workflow Language (CWL) compatible parallelization software. 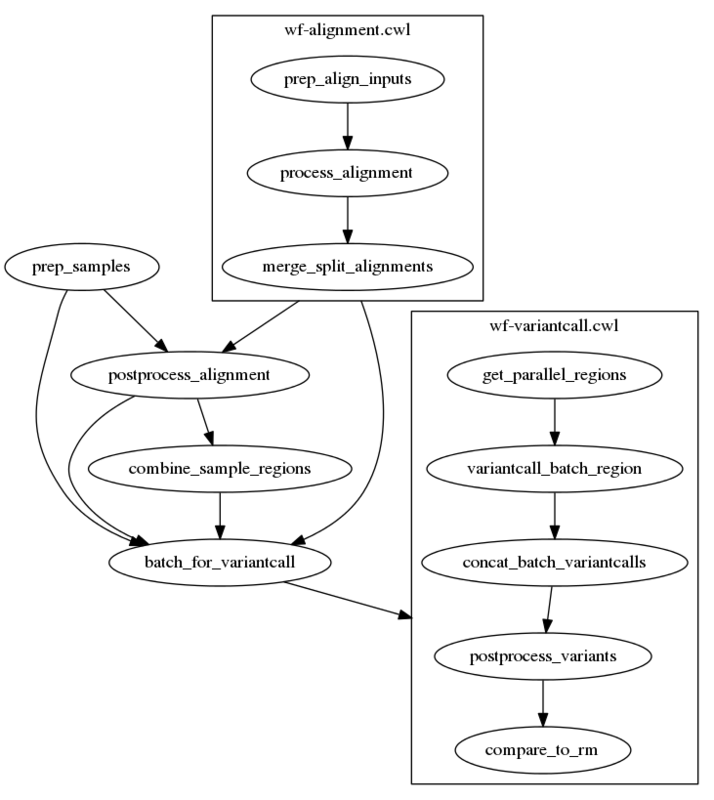 bcbio generates a CWL workflow from a standard bcbio sample YAML description file and any tool that supports CWL input can run the workflow. CWL-based tools do the work of managing files and workflows, and bcbio performs the biological analysis using either a Docker container or a local installation. bcbio creates CWL for alignment, small variant calls (SNPs and indels), coverage assessment, HLA typing, quality control and structural variant calling. It generates a CWL v1.0.2 compatible workflow. The actual biological code execution during runs works with either a bcbio docker container or a local installation of bcbio. The implementation includes bcbio’s approaches to splitting and batching analyses. At the top level workflow, we parallelize by samples. Using sub-workflows, we split fastq inputs into sections for parallel alignment over multiple machines following by merging. We also use sub-workflows, along with CWL records, to batch multiple samples and run in parallel. This enables pooled and tumor/normal cancer calling with parallelization by chromosome regions based on coverage calculations. Cromwell – multicore local runs and distributed runs on HPC systems with shared filesystems and schedulers like SLURM, SGE and PBSPro. Arvados – a hosted platform that runs on top of parallel cloud environments. We include an example below of running on the public Curoverse instance running on Microsoft Azure. DNANexus – a hosted platform running distributed jobs on cloud environments, working with both AWS and Azure. Seven Bridges – parallel distributed analyses on the Seven Bridges platform and Cancer Genomics Cloud. Toil – parallel local and distributed cluster runs on schedulers like SLURM, SGE and PBSPro. rabix bunny – multicore local runs. cwltool – a single core analysis engine, primarily used for testing. We plan to continue to expand CWL support to include more components of bcbio, and also need to evaluate the workflow on larger, real life analyses. This includes supporting additional CWL runners. We’re working on evaluating Galaxy/Planemo for integration with the Galaxy community. bcbio-vm installs all dependencies required to generate CWL and run bcbio, along with supported CWL runners. There are two install choices, depending on your usage of bcbio: running CWL with a existing local bcbio install, or running with containers. To run bcbio without using containers, first install bcbio and make it available in your path. You’ll need both the bcbio code and tools. To only run the tests and bcbio validations, you don’t need a full data installation so can install with --nodata. Adding this to any future upgrades will also update the bcbio-vm wrapper code and tools. When you begin running your own analysis and need the data available, pre-prepare your bcbio data directory with bcbio_nextgen.py upgrade --data --cwl. This install includes bcbio-nextgen libraries, used in generating CWL and orchestrating runs, but is not a full bcbio installation. It requires Docker present on your system this is all you need to get started running examples, since the CWL runners will pull in Docker containers with the bcbio tools. Thes wrappers automatically handle temporary directories, permissions, logging and re-starts. If running without Docker, use a local installation of bcbio add --no-container to the commands in the shell scripts. A standard bcbio sample configuration file defining the samples. This can either be a full prepared YAML file or a template file and CSV with sample data. A bcbio_system.yaml file defining the system environment for running the program. This includes the resource specification with cores and memory per core for your machines. For choosing cores and memory per cores, you generally want to set this to match the parameters of a single machine either for a local run or on a cluster. producing a sample-workflow output directory with the CWL. On a first CWL generation run with a new genome, this process will run for a longer time as it needs to make your reference compatible with CWL. This includes creating single tar.gz files from some reference directories so they can get passed to CWL steps where they’ll get unpacked. This process only happens a single time and keeps unpacked versions so your reference setup is compatible with both old bcbio IPython and new CWL runs. You can now run this with any CWL compatible runner and the bcbio_vm.py cwlrun wrappers standardize running across multiple tools in different environments. The Cromwell workflow management system runs bcbio either locally on a single machine or distributed on a cluster using a scheduler like SLURM, SGE or PBSPro. If you want to run from a locally installed bcbio add --no-container to the commandline. Tweak scheduler parameters using the same options as the older bcbio IPython approach. To control the resources used Cromwell, set –joblimit to the allowed jobs allocated concurrently. This isn’t total cores used, but rather the number of jobs either locally or remotely scheduled concurrently. Since CWL steps are heterogeneous and use only cores necessary for that job, the total cores used will max out at joblimit times maximum cores for an individual process. Setting this helps avoid over-committing jobs to a shared scheduler during highly parallel processes like variant calling. Cromwell can also run directly on cloud resources: Google Cloud (GCP). The Toil pipeline management system runs CWL workflows in parallel on a local machine, on a cluster or at AWS. bcbio generated CWL workflows run on Arvados and these instructions detail how to run on the Arvdos public instance. Arvados cwl-runner comes pre-installed with bcbio-vm. We have a publicly accessible project, called bcbio_resources that contains the latest Docker images, test data and genome references you can use for runs. Retrieve API keys from the Arvados public instance. Login, then go to ‘User Icon -> Personal Token’. Copy and paste the commands given there into your shell. You’ll specifically need to set ARVADOS_API_HOST and ARVADOS_API_TOKEN. Create a new project from the web interface (Projects -> Add a new project). Note the project ID from the URL of the project (an identifier like qr1hi-j7d0g-7t73h4hrau3l063). bcbio runs on the DNAnexus platform by converting bcbio generated CWL into DNAnexus workflows and apps using dx-cwl. This describes the process using the bcbio workflow app (bcbio-run-workflow) and bcbio workflow applet (bcbio_resources:/applets/bcbio-run-workflow) in the public bcbio_resources project, Both are regularly updated and maintained on the DNAnexus platform. Secondarily, we also show how to install and create workflows locally for additional control and debugging. $PNAME – The name of the project you’re analyzing. For convenience here we keep this the same for your local files and remote DNAnexus project, although that does not have to be true. $DX_AUTH_TOKEN – The DNAnexus authorization token for access, used for the dx command line tool and bcbio scripts. $DX_PROJECT_ID – The DNAnexus GUID identifier for your project (similar to project-F8Q7fJj0XFJJ3XbBPQYXP4B9). You can get this from dx env after creating/selecting a project in steps 1 and 2. The app will lookup all files, prepare a bcbio CWL workflow, convert into a DNAnexus workflow, and submit to the platform. The workflow runs as a standard DNAnexus workflow and you can monitor through the command line (with dx find executions --root job-YOURJOBID and dx watch) or the web interface (Monitor tab). If you prefer not to use the DNAnexus app, you can also submit jobs locally by installing bcbio-vm on your local machine. This can also be useful to test generation of CWL and manually ensure identification of all your samples and associated files on the DNAnexus platform. bcbio runs on the Seven Bridges including the main platform and specialized data sources like the Cancer Genomics Cloud and Cavatica. Seven Bridges uses generated CWL directly and bcbio has utilities to query your remote data on the platform and prepare CWL for direct submission. Since Seven Bridges is available on multiple platforms and data access points, we authenticate with a configuration file in $HOME/.sevenbridges/credentials with potentially multiple profiles defining API access URLs and authentication keys. We reference the specified credentials when setting up a bcbio_system-sbg.yaml file to ensure correct authentication. bcbio generates a common workflow language description. Internally, bcbio represents the files and information related to processing as a comprehensive dictionary. This world object describes the state of a run and associated files, and new processing steps update or add information to it. The world object is roughly equivalent to CWL’s JSON-based input object, but CWL enforces additional annotations to identify files and models new inputs/outputs at each step. The work in bcbio is to move from our laissez-faire approach to the more structured CWL model. wf-*.cwl – CWL sub-workflows, describing sample level parallel processing of a section of the workflow, with potential internal parallelization. steps/*.cwl – CWL descriptions of sections of code run inside bcbio. Each of these are potential parallelization points and make up the nodes in the workflow. To help with defining the outputs at each step, there is a WorldWatcher object that can output changed files and world dictionary objects between steps in the pipeline when running a bcbio in the standard way. The variant pipeline has examples using it. This is useful when preparing the CWL definitions of inputs and outputs for new steps in the bcbio CWL step definitions. Support the full variant calling workflow with additional steps like ensemble calling, heterogeneity detection and disambiguation. Port RNA-seq and small RNA workflows to CWL. © Copyright 2018, bcbio-nextgen contributors Revision 8ba6c5e7.